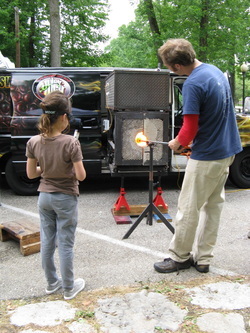 Since 2007 I've been working on "Juicy Lucy", a mobile Glassblowing studio. As a partnership between Louisville Glassworks and Westport Village, this experimental studio is designed to travel around the Louisville, Kentucky region and expose people to live glassblowing demonstrations. Lucy is available for special occasions, parties, art festivals, from march-november. Page Von Roenn and Matthew McCormick (of McCormick Motorsports) made this project possible. Page helped put A and B to make Z...i'm indebted to her for her help and assistance in making this possible. 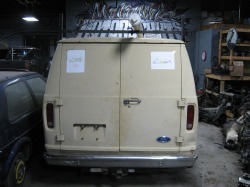 Matt turned an old plumbing van (with a CAT diesel engine!) into a mean glassblowing machine, and i'm thankfull everytime she starts! What does it take to Blow Glass out of a Hotrod? How Can I Get Lucy to my Event? We like to take Lucy on the road. Based out of Louisville, Kentucky we can do day trips (within 100 miles). We have done Art Fairs, Glass Conferences, Fourth Street Live, Chance School, WestportVillage to name a few. 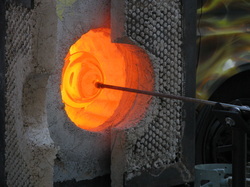 If you have an event that glassblowing would be a welcome addition, Click here!